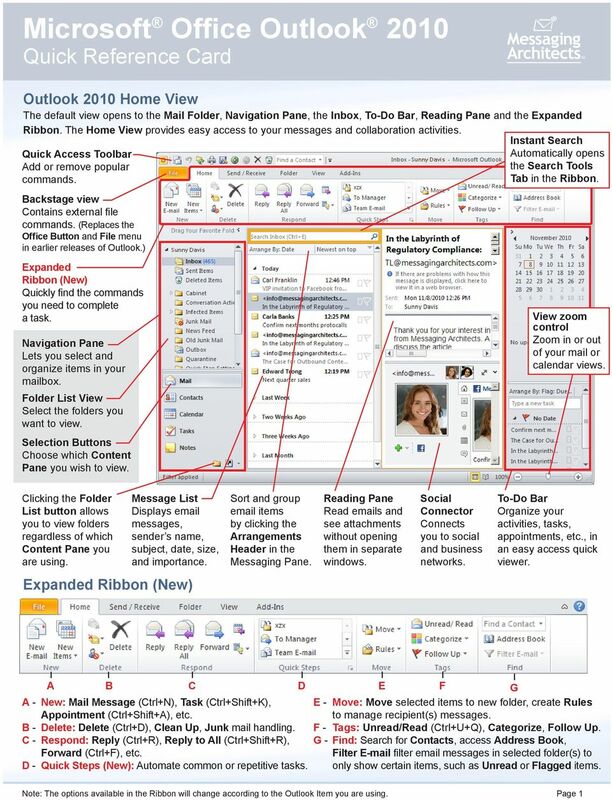 Download "Microsoft Office Outlook 2010 Quick Reference Card"
6 Sharing Folders, Contacts, Calendar, Notes, and Journals (1.) 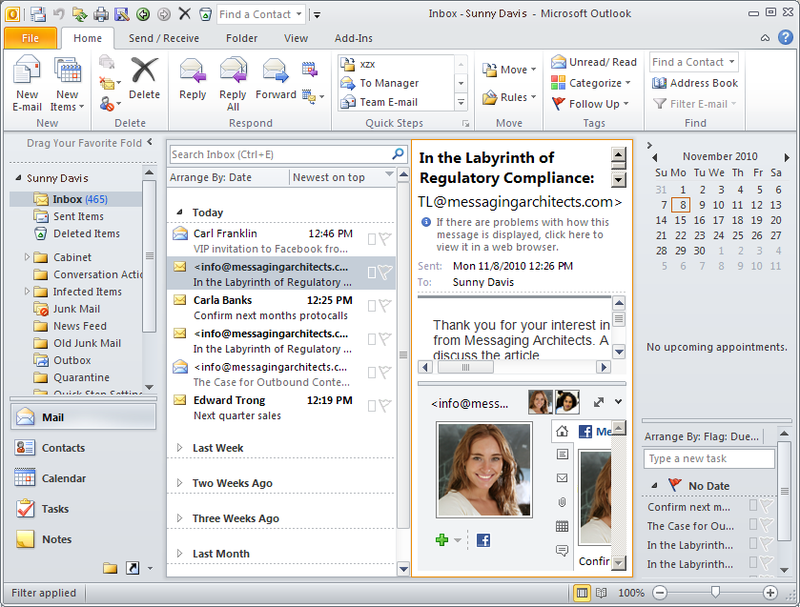 In the Navigation Pane, Right-click the folder or item you want to share, and then click Sharing. (2.) 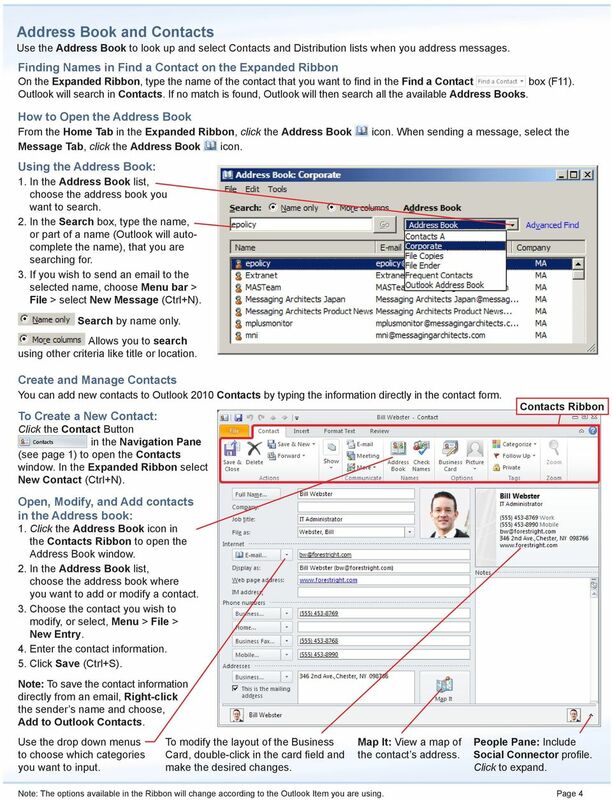 In the Sharing Window, click Add to open the Address Book. (3.) In the Address Book, select the person you want to give permissions to, and then click Add. (4.) 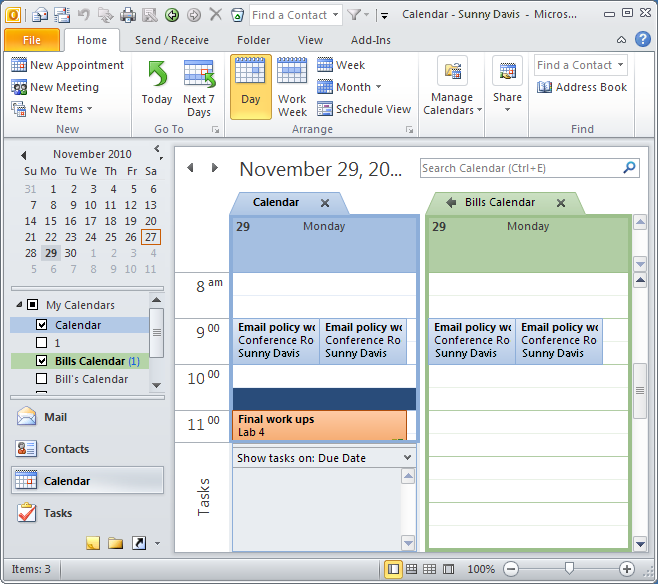 In the Sharing Window, select the user s name in the list, and then choose the Permission Level. (5.) Click OK. 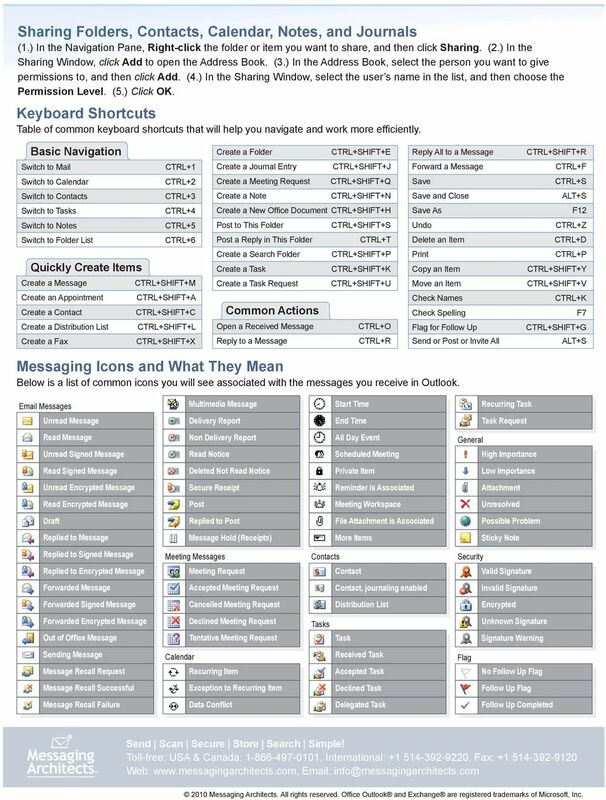 Keyboard Shortcuts Table of common keyboard shortcuts that will help you navigate and work more efficiently. 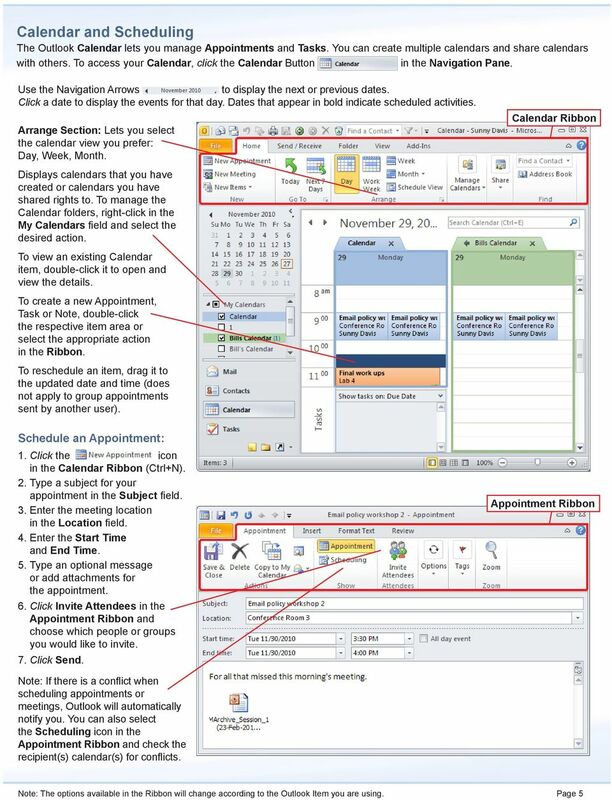 Basic Navigation Create a Folder CTRL+SHIFT+E Reply All to a Message CTRL+SHIFT+R Switch to Mail CTRL+1 Create a Journal Entry CTRL+SHIFT+J Forward a Message CTRL+F Switch to Calendar CTRL+2 Create a Meeting Request CTRL+SHIFT+Q Save CTRL+S Switch to Contacts CTRL+3 Create a Note CTRL+SHIFT+N Save and Close ALT+S Switch to Tasks CTRL+4 Create a New Office Document CTRL+SHIFT+H Save As F12 Switch to Notes CTRL+5 Post to This Folder CTRL+SHIFT+S Undo CTRL+Z Switch to Folder List CTRL+6 Post a Reply in This Folder CTRL+T Delete an Item CTRL+D Quickly Create Items Create a Search Folder Create a Task CTRL+SHIFT+P CTRL+SHIFT+K Print Copy an Item CTRL+P CTRL+SHIFT+Y Create a Message CTRL+SHIFT+M Create a Task Request CTRL+SHIFT+U Move an Item CTRL+SHIFT+V Create an Appointment Create a Contact Create a Distribution List Create a Fax CTRL+SHIFT+A CTRL+SHIFT+C CTRL+SHIFT+L CTRL+SHIFT+X Common Actions Open a Received Message Reply to a Message CTRL+O CTRL+R Check Names Check Spelling Flag for Follow Up Send or Post or Invite All CTRL+K F7 CTRL+SHIFT+G ALT+S Messaging Icons and What They Mean Below is a list of common icons you will see associated with the messages you receive in Outlook. Messages Multimedia Message Start Time Recurring Task Unread Message Delivery Report End Time Task Request Read Message Non Delivery Report All Day Event General Unread Signed Message Read Notice Scheduled Meeting High Importance Read Signed Message Deleted Not Read Notice Private Item Low Importance Unread Encrypted Message Secure Receipt Reminder is Associated Attachment Read Encrypted Message Post Meeting Workspace Unresolved Draft Replied to Post File Attachment is Associated Possible Problem Replied to Message Message Hold (Receipts) More Items Sticky Note Replied to Signed Message Meeting Messages Contacts Security Replied to Encrypted Message Meeting Request Contact Valid Signature Forwarded Message Accepted Meeting Request Contact, journaling enabled Invalid Signature Forwarded Signed Message Cancelled Meeting Request Distribution List Encrypted Forwarded Encrypted Message Out of Office Message Declined Meeting Request Tentative Meeting Request Tasks Task Unknown Signature Signature Warning Sending Message Message Recall Request Calendar Recurring Item Received Task Accepted Task Flag No Follow Up Flag Message Recall Successful Exception to Recurring Item Declined Task Follow Up Flag Message Recall Failure Data Conflict Delegated Task Follow Up Completed Send Scan Secure Store Search Simple! Toll-free: USA & Canada: , International: , Fax: Web: Messaging Architects. All rights reserved. 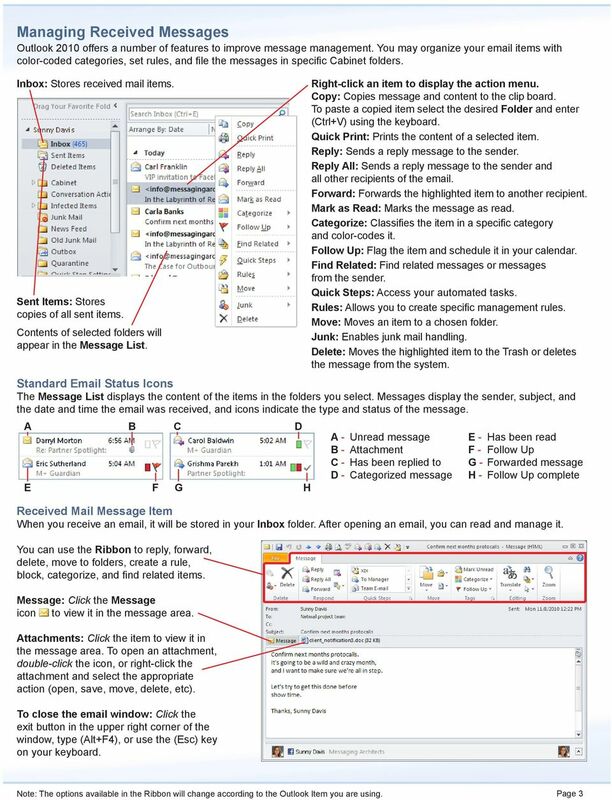 Office Outlook and Exchange are registered trademarks of Microsoft, Inc.
Mail Quick Reference Guide 3 Outlook 2013 for Windows Mail Within a message dialog box, there are multiple tabs with various commands which display on a ribbon; the features are organized in logical groups. 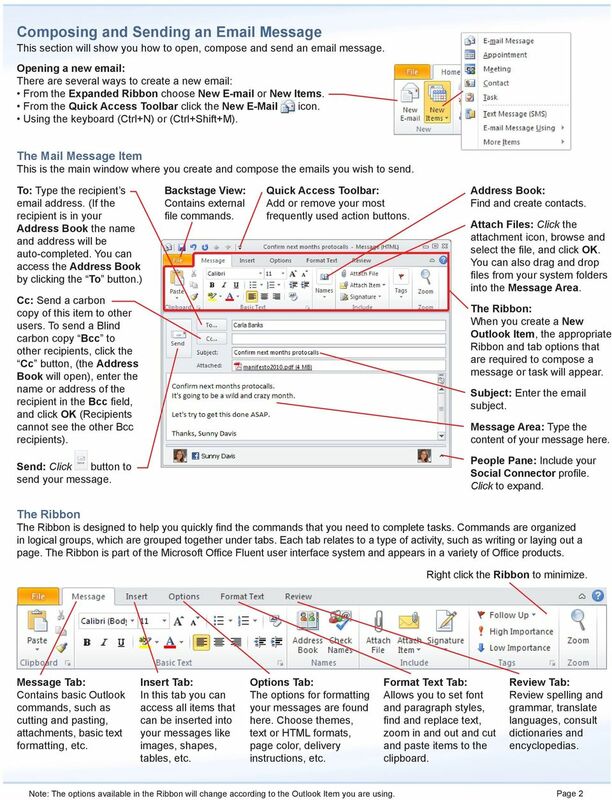 Mail Quick Reference Guide 3 Outlook 2010 for Windows Mail Within a message dialog box, there are multiple tabs with various commands which display on a ribbon; the features are organized in logical groups.